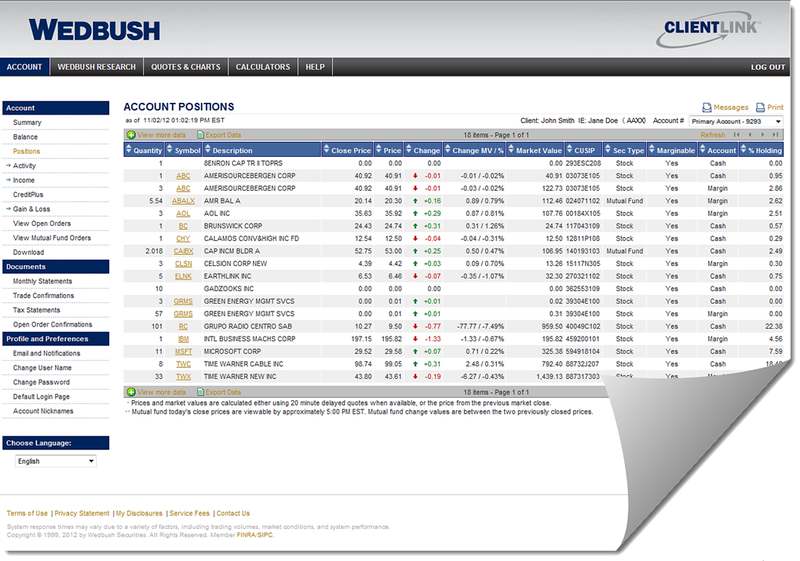 CLIENTLINK™ provides convenient and secure online access to your Wedbush account 24 hours a day, 7 days a week. Access your account portfolio, activity, statements and more through our easy to use website. We take special care in maintaining the privacy and security of your account information. The registration and login process follows industry best practices and all information that is transmitted to and from your browser is encrypted to current security standards. Click here for additional details regarding security. Contact your Wedbush Financial Advisor or Click here to find one. Please contact our IT HelpDesk at (888) 933-2874 or email clientlink@wedbush.com. Summary of all your accounts within a household including cash/money market value, balances, market value, and total net worth in one page. Unrealized and realized gain & losses both in summary and detail. Individual account’s current money balances, market values, total net worth, interest rate, total available funds, buying power, and more. Download your account information directly to Quicken. Account portfolio view including detailed information about each position such as number of shares, current market price, current market value and many more data points. Access all of your monthly statements, tax statements, trade and open order confirmations. Current and historical account activity such as trades, credits, debits, cash flow and more. Lookup market data and news such as quotes, charts and options. Pending and projected dividends, interests, shares summarized and by security. Full access to all of Wedbush Securities’ research reports and notes. Current and historical CreditPlus™ activity. Please click here for more information about CreditPlus™. Option to use CLIENTLINK™ in English, Spanish, Korean, Chinese Simplified or Chinese Traditional.